Happy Monday, friends! 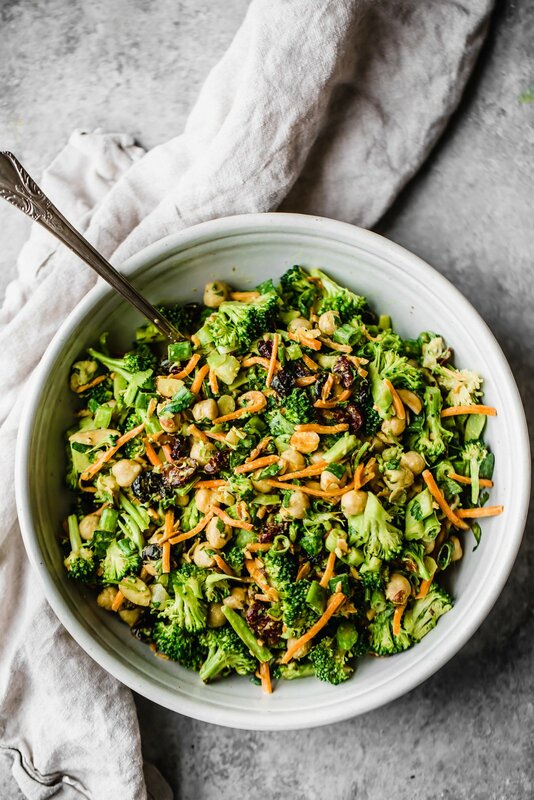 There’s a new favorite AK salad to celebrate that Abra and I could just not stop eating: this vegan and gluten free curried broccoli chickpea salad. Seriously this is a recipe guaranteed to keep you coming back for seconds. Why? Well for starters, there’s no cooking involved and it only takes 15-20 minutes from start to finish. Easy, right? I know that many of you love my quick and easy salad recipes so I’m making it my mission to bring you more of them this year, so get excited. 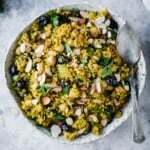 By the way, if you haven’t tried my moroccan chickpea quinoa salad yet, you need to ASAP. Both are plant-based party pleasers. It’s important to chop the broccoli very fine when making this salad. You could also use cauliflower if you prefer. And yes, it’s raw and IT IS DELICIOUS. You can make the dressing as sweet as you like. I prefer only a teaspoon of maple syrup, but ultimately it’s up to you. This recipe keeps well in the fridge. So if you’re looking for a healthy recipe to have during the week, THIS IS IT! 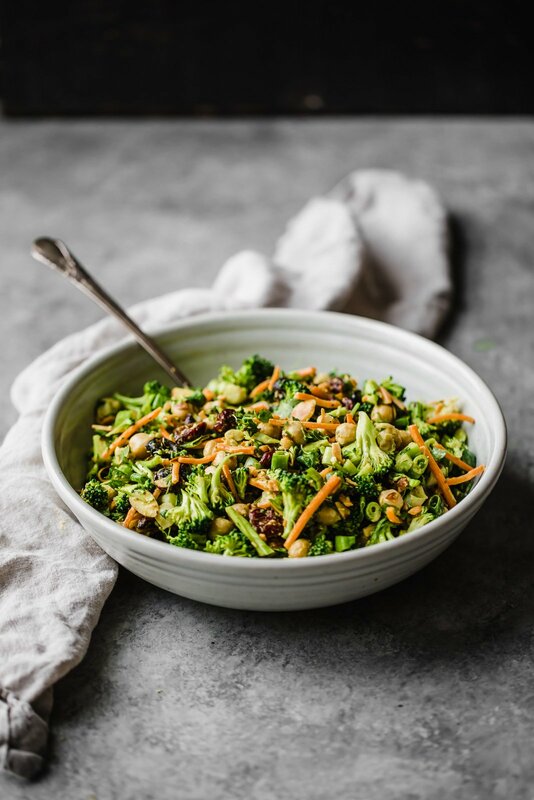 Fresh vegan curried broccoli chickpea salad with an amazing tahini dressing. 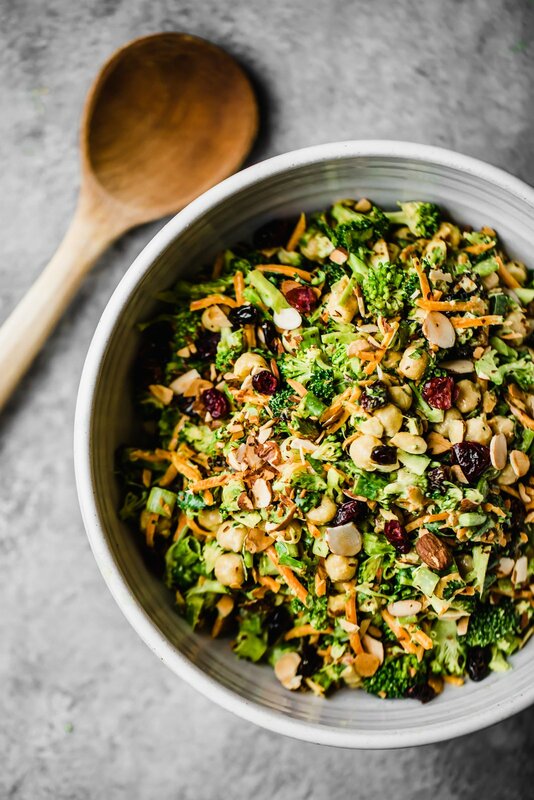 This salad packs plenty of protein and fiber for a satisfying lunch that's perfect for meal-prep! If you are making this for a party, it most likely serves 6 rather than 4 people. To toast almonds: Add sliced almonds to a pan and place over medium heat. Use a spatula to stir the almonds; stirring every 30 seconds or so until they are nice and golden brown, about 5 minutes total time. If pan begins to smoke, make sure to reduce the heat to prevent burning. 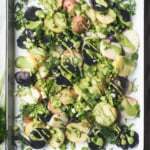 112 Responses to "Vegan Curried Broccoli Chickpea Salad"
You make the most delicious salads. PLEASE make more! I love them! Hi Kristen! You got it 🙂 More to come this spring/summer!! Wow! This is my kind of salad! Love all the vegan recipes! So much flavor in here! Hope you get a chance to make it! I agree, the Moroccan chickpea quinoa salad is the SH*T! I’m making this too, just ran out of Tahini dangit (all your fault for the Paleo Chicken Meatballs ha!) so gonna hit Trader Joe’s on my way home from work so I can make this! YUM!!!! I can’t wait to make this! I’m the envy at the staff lunch table when I bring in your salads. This one is going to make their taste buds water that’s for sure! This one will cause major salad envy 😉 hope you love it! 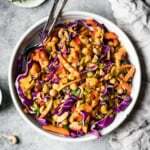 Giant salads with LOADS of vegetables in a spicy curry sauce, all along with a few little sweet and crunchy toppings, are my absolute favorite! I prefer roasting my vegetables before assembling them in a salad rather than eating them raw, but I still don’t discriminate. Either method is delicious! Hey Monique, my s on is allergic to sesame seeds hence is there a replacement for the tahini in the dressing recipe…he is vegetarian. Thank u. Do you think that peanut butter would be okay to substitute for the tahini? I think so! I would stick with a natural peanut butter (one that’s pretty drippy) – it will probably have a distinct peanut butter flavor. Cashew butter is also more mild like tahini! Made this last night, and it’s amazing! I subbed in ginger paste (trader Joe’s) and red curry paste (my grocery store didn’t have yellow curry powder without MSG). Thanks for another amazing recipe! Great! So glad you enjoyed! Made this last night, and even my 14 year old daughter was devouring it! It’s THAT good!! Thank you – really delicious and so easy to make! YUM! I like the addition of cranberries! Made this last night and I’m currently eating it in my office for lunch! I just let a coworker try it and she said “omg your salad wins.” It’s really flavorful and has great texture. I hate soggy salads, so I’m excited to have something that I can prep beforehand and have for weekday lunches. Question: for my soap-tasting-cilantro-hating friends, what can I replace the cilantro with when making for them? Thanks, Monique!! Tahini free?You are my savior! I can never find tahini when I need it and I am too impatient to make it! Thank you!! Made this last night, and it’s amazing! I subbed in ginger paste (trader Joe’s) and red curry paste (my grocery store didn’t have yellow curry powder without MSG). Made this last night and I’m currently eating it in my office for lunch! I just let a coworker try it and she said “omg your salad wins.” It’s really flavorful and has great texture. Made this last night and it was excellent. Not a fan of curry powder so subbed with 1 tsp cumin. All my girlfriends loved it and so did my picky son. Thanks for another great healthy salad! Just made it and it’s delicious. Thanks! I love all the crunchiness. Just for the sake of experimenting, I wonder how it would taste with plain Greek yogurt added to the dressing. I might try it next time. Isn’t the texture amazing? One of my favorite salads! Let me know how the Greek yogurt goes! I made this salad last night and it is fantastic! I live in Thailand so finding tahini turned out to be a real challenge. I used natural peanut butter as a substitute and wowza is this good! I’m a working mom, so to save time I whizzed everything in the food processor and it is really hitting the spot. This is going on the repeat list. Perfect!! Sunflower seeds sound great in here 🙂 Glad you enjoyed! I get mine at Trader Joe’s or Whole Foods! Didn’t have dried cranberries on hand so I left them out and it was still delicious!! 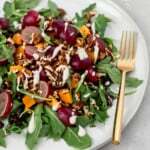 Thanks Monique for these delicious salad recipes- keep ’em comin’! I was just saying I want to make more salads that aren’t lettuce based. This fits the bill perfectly and it sounds delicious. I’m gonna try it tonight! YES this one is perfect! Hope you loved it! SO happy to hear that Alison! Glad you could get some me-time in too 🙂 It makes great leftovers for the week! I made it last night. It was really delicious. So much so that I ate 2 plates full. So happy to hear that Matt! Wow, Monique this recipe is truly a go-to-meal for those hard-pressed days when I simply do not have ample time to cook food from scratch. This is truly a life-saver. Not only is this delicious, it is also healthy! I just chose to omit or lessen the amount of grated ginger in mine since I’m not really a fan of it. 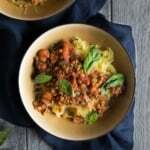 I praise you for taking the time to put a video on how to make this recipe and the nutritional facts that come along with it. Thank you! So happy to hear that Elizabeth! It’s one of my new go-to’s for quick, easy lunches (with delicious leftovers). Thanks for your note! Tried it but did not care for the flavor profile. I won’t make it again. Do you think you could substitute the maple syrup for honey? Can you use regular curry powder? SO GOOD! Those swaps sounds perfect. Best leftovers ever! Loved this, as did my young adult daughter and my husband. And as a bonus I was down 2 lbs the morning after I made it, probably because it’s much lower carb and calorie than a traditional dinner for us. Our stores didn’t have a yellow curry powder. Struck me that maybe a sweet curry powder would be right, but I didn’t have one on hand. So I used 1/2 as much of regular curry powder and it turned out great. Thanks for a great recipe that also made great leftovers. Made it, LOVED it! Thank you!! Major success at a Potluck…absolutely delicious! Anne, your comment about your tastebuds makes me smile! Wow, this is absolutely delicious! Thank you. Monique, thank you so much for sharing this recipe. I’ve been wanting to make it since I discovered it last week + I just did. Made a slight tweak: subbed raisins for cranberries. it is unbelievably delicious, crunchy + just this-side-of-heaven. I’ve found my Sunday-prep weekly lunch. Thank you, again. Please keep sharing. Amazing recipe. Made it today for supper. Both my husband and I loved it. Hello, do u cook the broccoli beforehand? Or is it raw? Made this on vacation (brought the dressing already made). We LOVEDthis salad!! Added some cooked quinoa to it and served it over some arugula. Winner ! Amazing!! So happy to hear that 🙂 Quinoa sounds great in here! OMG I just made this salad today. Its is sooo good! Wonderfully fresh from the veggies and tahini dressing. I cant wait to bring it to my next Pot luck dinner!!! Just made this and it is amazing! I added dried cherries because I live in MI and it’s cherry season! I will definitely be making this again and taking it to parties! Thank you!!! 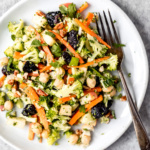 Great salad – very healthy and filling. The only thing I will try next time when I make it is to slightly steam the broccoli as I found them a bit tough on my digestive system. Yes, steaming the broccoli a bit should help. Glad you enjoyed this one! Hello! I’m making this salad for a party tomorrow. I’m about 24 hours out from serving it and wondered if I should dress it tonight or will my salad get soggy? Hi Gayle! The salad stays very crunchy even the next day, so you can dress it the night before (or the morning of). I made this salad for lunches this week. So delicious and easy to make! Perfect for weekday lunches! Glad you enjoyed, Johanna. This is genuinely one of the BEST recipes I’ve ever tried. Everything is perfect. 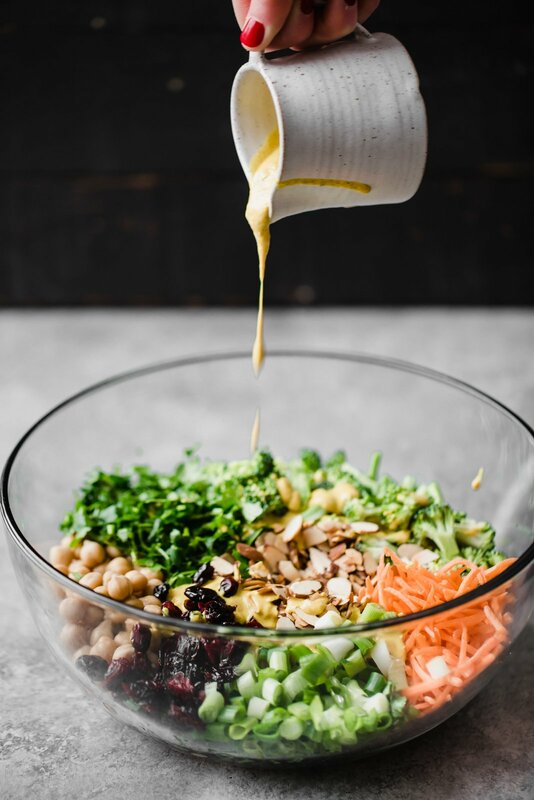 The dressing is SO flavorful and didn’t need any modifications. I put the salad over mixed greens and topped with a little extra lemon juice. There’s no way to describe this dish other than FABULOUS. I’m glad you love this one Rachel! 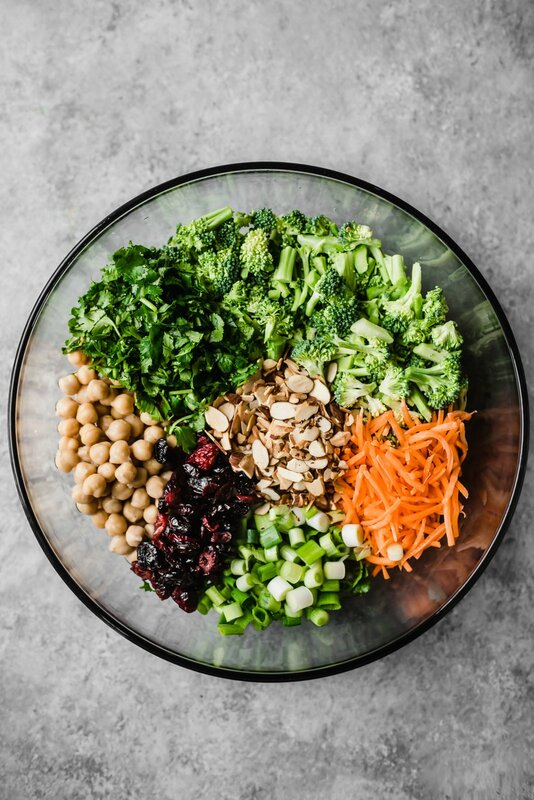 Love the idea of serving over mixed greens, too. This is the first time I’ve ever felt compelled to comment on a recipe. Here because a.) It’s great and b.) I made 2 modifications that I’d like to share! I had an open container of plain nonfat yogurt to use up and also wanted a heavily dressed version of this without the added fat of extra tahini; added in 1/2 a cup to the dressing along with about 1/2 tbsp of sesame oil. Also diced up the remaining 1/2 of a green bell pepper in the fridge and threw it in. This recipe is forgiving and adaptable, highly encourage people to make it their own. Thanks for the recipe, Monique! Glad those swaps worked out for you! This one is perfect for customizing. Fav lunch! 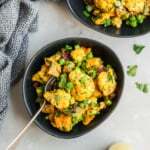 Monique, this is yet another keeper savory recipe from you!! I love the combinations you come up with. This is delicious! I think it might become my go to salad that I take to potlucks. And I’m not one to bring the same thing, as I like to try new recipes, but this is that good! I’m glad you found this one! Perfect for parties & potlucks (I meal prep it all the time, too). Hi Francine! Dried cranberries are usually sweetened, but you can find unsweetened ones in the bulk section at Whole Foods or with certain brands like this one. I usually get mine from the bulk section or just use what I have on hand! I’m so obsessed with this recipe – so quick and healthy. I make it at least once a week and perfect to bring to work. I do have a question about shelf life – I know garbanzo beans are typically best consumed within 3-4 days. Do you find that they’re still good after 5? I know you said it can last up to 5 days. Thanks for this awesome recipe!